My sweet baby girl recently celebrated her first birthday, and we had a small party in her honor with our extended family. Since my daughter hasn't yet discovered Elmo, Nemo, or Frodo, I had free reign to pick a theme. I decided to go with a vintage theme so I could decorate with some vintage toys that I already had at home. I'll share pictures of some of the vintage items in a later post. 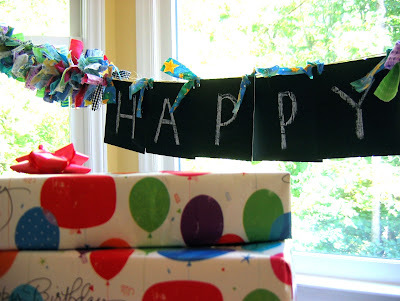 The party decor pièce de résistance was this rag garland/chalkboard "Happy Birthday" banner. 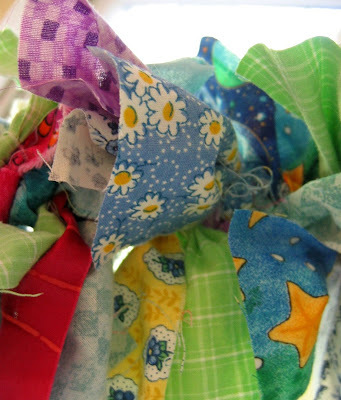 The ragamuffin garland element was inspired by one that I saw here made by blogger Kimba. 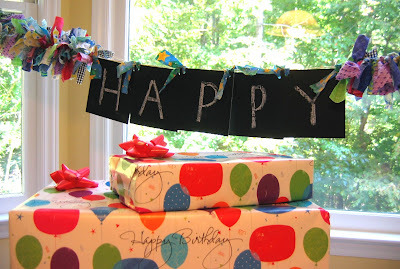 I added removable chalkboard letters so I can customize the message for future celebrations. 2. My fabric strips were 2" by 8"
It also helps if you have your mom visiting from California to help you tie on the endless strips of fabric. It is her job to groan halfway through the project, "You know, most people would just buy a banner!" To this, if you're like me, you will respond, "But what fun would that be?" The truth is that I have a pathological need to make things by hand to celebrate special occasions. When I got married, I made my own veil and bouquet, and I strung the pearls to make my necklace. I don't like to outsource the fun projects, and in my opinion, they're all fun projects, which explains why I am the World's Worst Delegator. 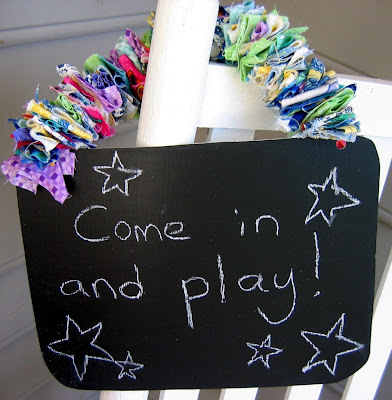 Plastic coated poster boards from Sherwin Williams formed the backing for the chalkboard letters. The boards are designed for testing faux paint finishes and retail for less than $2 each. They don't buckle--even under multiple coats of paint--and they can be cut with scissors. This project required two poster boards, but I ended up with extra pieces. To make the chalkboard squares, I painted 2 coats of chalkboard paint on the boards, then cut out pieces that were 5"wide x 5.5"high. A regular 3 hole punch was strong enough to punch holes in the pieces for hanging on the garland. I used 1" x 8" fabric ties to tie the letters onto the banner. I made this sign for the front porch with left over materials from the banner. To make the garland portion of the sign, I just ran a needle and thread through small fabric scraps, which I kind of bunched up or loosely folded to about 1" x 1". It only took a few minutes. In my next post, I'll share some images of the vintage toys, as well as a gratuitous mini cupcake photo. 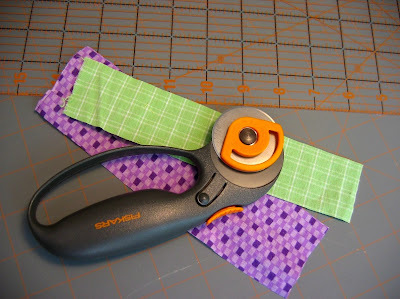 This post has been linked to other great DIY projects at A Soft Place to Land, Today's Creative Blog, and Reinvented.